The countdown to the finals of the European Enterprise Promotion Awards (EEPA) 2018 continues! Last week we met the shortlisted projects from Category 1: Promoting the Entrepreneurial Spirit. This week it is time to meet the projects competing in Category 2: Investing in entrepreneurial skills, which come from Austria, Ireland and Lithuania. The i²c STARTacademy is an innovative research commercialisation format for TUW scientists who want to transfer their technology and research results into successful products or services. It provides them with a personalised framework to plan their market entry by bringing them together with domain-specific national and international mentors, coaches, investors and industry representatives to work together on the commercial potential of their conducted research. Three years after it was launched the project has provided training and coaching to 91 researchers (40 teams), which has resulted in the generation of 23 start-ups and 85 jobs. ACORNS is a peer to peer support programme in which successful business women (Lead Entrepreneurs) voluntarily facilitate groups of early stage female entrepreneurs. The groups serve to establish good foundations in the new early stage businesses and equip the entrepreneurs with necessary skills to develop and grow sustainable businesses. Both Lead Entrepreneurs and participants are located in rural Ireland and the aim of the programme is to create sustainable businesses throughout rural Ireland to create more jobs over time. To date over 150 early stage female entrepreneurs have been supported with a range of demonstrable results including new jobs created. Entrepreneurship Academy is a tool and education platform for the development of entrepreneurial competences and skills based on active experiential methods. It brings together a network of over 70 partners including youth groups, education institutions, business and city authorities, and other partners. Participating youth have a year to learn about local businesses and entities, and to utilise the three academy modules: Development of entrepreneurial competences, Entrepreneurship labs and Personal development programmes. Since 2015 more than 800 students and 300 schoolchildren have participated and over 260 creative workshops, seven public events and seven experiential camps have been organised within the project. The second category of the EEPA, “Investing in Entrepreneurial Skills” recognises initiatives that improve entrepreneurial and managerial skills. This year the entries come from across eight different countries and will be competing for spots on the final European shortlist determined by the EEPA 2018 Jury in late September. Come back to Promoting Enterprise every week to discover the national winners across the other five EEPA categories: Promoting the entrepreneurial spirit, Improving the business environment, Supporting the internationalisation of business, Supporting the development of green markets and resource efficiency and Responsible and inclusive entrepreneurship. EEPA 2017 winner Business Generator from Sweden may be on a temporary pause, but they still have many company success stories from the people they helped. Today, project director Anette Rhudin tells us about some of the women involved in Business Generator and their entrepreneurial stories. Kicki is a farmer from Värmland, who had the idea to create an app to make it easier for people to buy food directly from the farmers that produce it. Currently there is no “easy” connection between customers and farmers, and customers are forced to drive to several different farms to get the produce they are looking for. Kicki’s app creates that connection and allows farmers to directly communicate with their audience and promote their goods. When Marianne first came to Business Generator she was having a tough time with her hotel business and really needed help. During her time in the generator she learnt a lot and developed great skills surrounding customer questions and marketing. She worked hard and put a lot of money and her time to define her customers and “talk” to them. As a result of her training with the generator she changed her trademark and developed cooperative relationships with other tourist attractions in this area. Her success has allowed her to expand the number of rooms and bring significant investment to her village. She also makes sure to use décor from the area and offer local food from farmers close to the hotel. Anna is now a successful entrepreneur who is the fifth to run the Sahlströmsgården. Anna came to the Business Generator to successfully handle the generational shift and receive assistance with the associated legal changes. She handled all of this whilst still running the company and overseeing daily operations. At the beginning of Business Generator it was not easy to attract women to take part as they prioritised their businesses and did not see how to make time for generator activities. Eventually some saw the benefits of the generator and joined in to benefit from the support. 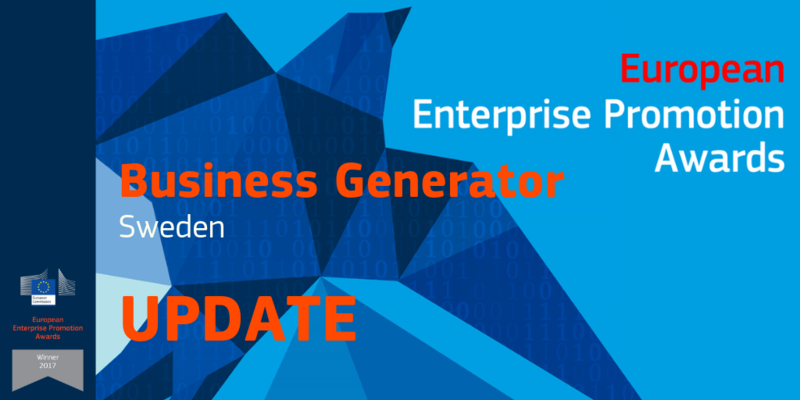 Read more about the Business Generator here on Promoting Enterprise and make sure you stay up to date with the EEPA 2018 competition. Business Generator – Where are they now? Today on Promoting Enterprise we are catching up with European Enterprise Promotion Award (EEPA) 2017 winner Business Generator, from Sweden, specifically project coordinator Annette Rhudin. The European Enterprise Promotion Awards reward those who promote entrepreneurship and small business at the national, regional and local level. The “Investing in entrepreneurial skills” category winner shares the future of Business Generator and what winning an EEPA prize and participating in the EEPA process meant to them. In an ideal world all European issues would be looked at from a European perspective, like those of SMEs being considered by the European Commission. Through initiatives like the EEPA competition, SMEs have been identified and celebrated as the backbone of European economy and key sources of employment. The EEPA competition also brings out certain issues that several SMEs face, and the support that projects, like Business Generator, are offering to entrepreneurs and enterprises across Europe. One thing that stood out for me, that has certainly been an issue for Business Generator, is disparity between regions and the need to adapt different strategies. Some regions are experiencing growth and have access to funds and resources, whereas others are struggling to grow and have little to no access to the same resources, like my own region of Värmland in Sweden. The EEPA competition is a fantastic opportunity to see what is going on in Europe, to meet others striving to help SMEs and ultimately gain visibility for the work you do. The future of Business Generator remains uncertain, and despite coming “top of the class” in Europe, will not continue, for now. The Business Generator team had several meetings at both regional and national level, but the budgets have already been defined and there is no surplus to fund the continuation of Business Generator. Municipal budgets have also been defined, and due to how tight they are, unfortunately there is no room for Business Generator. This is not to say that there is no interest in Business Generator, but for the project to continue interest alone is not enough. The project itself is new and innovative, and challenges old ways of thinking. Whilst this is the way forward for SMEs it is a daunting investment to make, and when budgets are tight means that it is less likely to receive support. This also represents the current situation in Sweden, where SMEs receive almost no government research and development funding, which is largely distributed to universities, large companies and the public sector. In comments from the Swedish National Audit Office, SMEs and innovation were recognised “as keys to Sweden’s future growth”, yet the body also stated that only “a minor part of total state aid to the business sector is directed at R&D and innovations as well as at small and medium-sized enterprises”. Whilst this is somewhat disheartening I believe that the solution is to take care of SMEs, and show this through concrete actions. I hope that there is a future for Business Generator and would be interested to know more about the situation in other countries regarding SME funding. Currently in Sweden, SME’s receive 3,7 % of the state aid, but deliver four out of five new jobs. My wish is that the funding statistics will change and that SMEs can continue to deliver jobs and receive the support they need both at national and European level. Whilst the Business Generator journey may have temporarily come to an end, I would like to thank the European Commission, for helping to highlight the good work that is going on across Europe through the EEPA competition. Finally, my message to potential future applicants, apply for EEPA 2018, this is an important opportunity and you should take it! Interested in finding out what happened to some of the companies helped by the Business Generator? Come back soon to find out right here on the Promoting Enterprise News Portal. What makes a successful European Enterprise Promotion Awards (EEPA) entry? What is the secret to winning at European level? Today on Promoting Enterprise, the 2017 edition winners tell us why others should enter EEPA 2018, and share their advice for making an application stand out. The 2017 winners shared a lot of advice in their testimonials but there were certain things that each of them mentioned as key to their EEPA success, and reasons why an EEPA prize is so valuable. 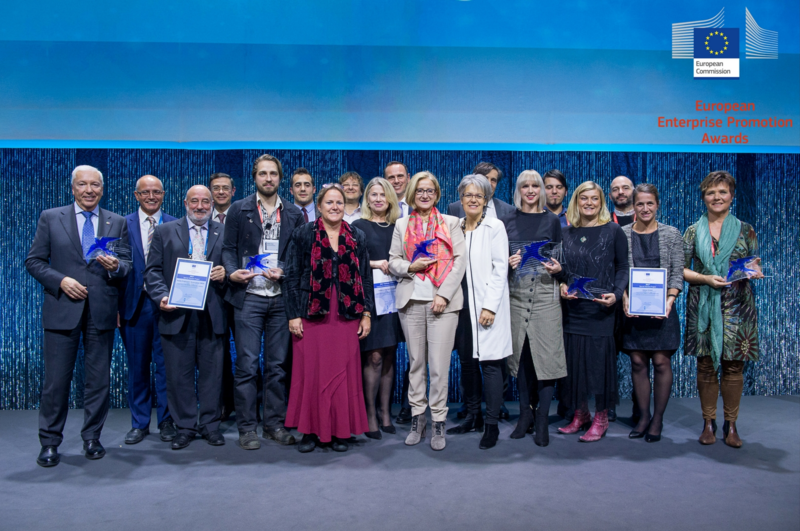 Firstly, all of the winners recognised the power of the EEPA scheme for bringing recognition to project work at European level, as well as the opportunity to see and interact with other projects that have been recognised as best European practices. In addition to European recognition, being a part of EEPA helped winners gain experience in pitching their projects. This is particularly useful when building awareness and a network around your work, and something that the EEPA application process values highly. Finally, all winners agreed that EEPA is a big contributor to increasing awareness around project work. Through EEPA, the winners had the opportunity to attend the prestigious SME Assembly, where they mingled with a variety of stakeholders and players in the entrepreneurial, SME and startup ecosystems. So what advice do the 2017 winners want to share with this year’s applicants? For more information on the 2017 winners, read the EEPA 2017 winner testimonials here. Some of the EEPA 2018 national competitions are still open, so check the national deadlines here and apply before it’s too late! Belgium, it is time to apply for EEPA 2018! The European Enterprise Promotion Awards (EEPA) are under way across Europe, but what does a competition look like on national level? Today our EEPA journey takes us to Belgium, where the national competition is coordinated by National Coordinator Francis Otte. Since 2006, Belgium has been participating in the EEPA awards scheme, and submitted a great variety of projects to compete at both national and European level. Of the all projects submitted, 3 have placed on the annual European shortlist and 3 have won prizes at European level, in both the ‘Investing in entrepreneurial skills’ and ‘Improving the business environment’ categories. This year the Belgian competition is open until 7 May 2018, so Belgian projects you know what to do! Get your applications in before your national deadline of 7 May 2018 in order to have the chance to represent Belgium on the European EEPA stage at the SME Assembly 2018. For more information on the Belgian EEPA competition read the flyer in French and Dutch. Visit the Belgian EEPA website for more information in French and Dutch.